Coral bleaching is a threat to reefs, but it does not directly kill corals. Photo: Ian Shive. In news reports about dying reefs, you’ll see one term again and again: coral bleaching. But what exactly is coral bleaching? In this Conservation Science 101, I’ll present a brief overview of what happens during a bleaching event, and also discuss some common misperceptions about this phenomenon. First, a bit about coral. Corals are animals but many have a plant living symbiotically with them. These plants are a class of algae, called zooxanthallae. These algae provide energy to the coral by photosynthesis. They also happen to give coral their colors. When coral face an environmental stress, they must put all their energy into surviving that threat. The algae are beneficial but also require some energy on the part of the coral. And so, the coral expel the algae. And as the algae goes, so goes the color of the coral. A coral with expelled algae can look white. And, let’s say it: sickly. Staghorn coral showing signs of bleaching. Photo: Ian Shive. Here’s a big misperception: Coral bleaching usually does not directly kill coral. The coral is still alive. In fact, it may regain its color and even thrive. The most common stressor that causes bleaching is high temperatures, hence the connection between climate change and bleaching. Yes, coral bleaching is increasing. Byrne notes the results of monitoring in South Florida. In 1987, he says, 20 percent of the corals bleached on area reefs. “It was considered disastrous,” he says. Caption: The vibrant colors – from symbiotic algae – are beginning to fade due to stress from rising water temperatures in this seemingly vibrant reef. Photo: Ian Shive. What can conservationists do? A focus of the Conservancy is restoring resilient reefs – reefs that are better able to withstand the impacts of climate change and other factors. Working with partners, the Conservancy is growing thousands of coral in nurseries at sites in the Keys and around the Caribbean. These coral are being extensively monitored to see if there are ways to build more resilient reefs. I’ll explore these nurseries more in a future blog. In the meantime, read more about the Conservancy’s work to protect coral reefs in the Caribbean and beyond. Quick comment – zooxanthallae (or Symbiodinium as they are correctly termed) are dull brown in colour due to their photosynthetic pigments (see http://i.imgur.com/EANhBPg.png). The bright colours seen in many reef building corals result from a range of fluorescent and non-flourescent host pigments from the coral itself, not from the Symbiodinium. 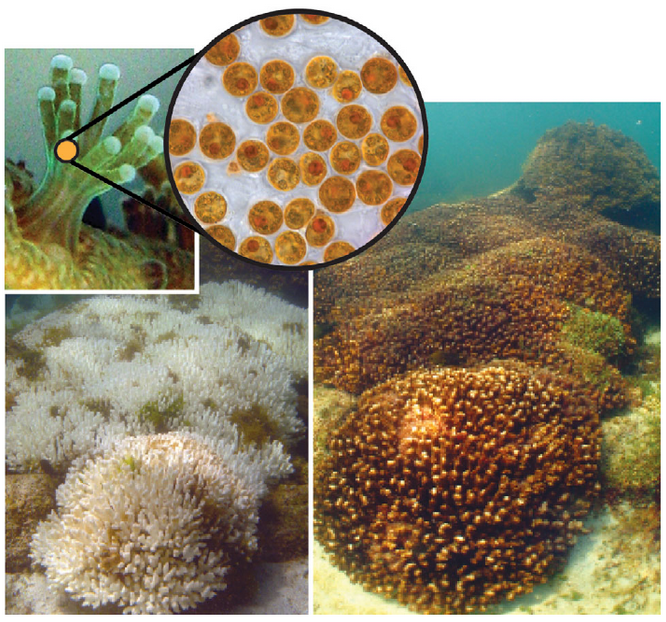 Many bleached corals still retain their bright fluorescent colours, although appear ‘bleached’ and bright in appearance as the brown pigmentation resulting from the Symbiodinium have been lost. Many thanks for reading the blog and for the clarification.